When I was a kid back in the ..well..that's not important is it!...Anyway when I was a kid the only live insect available from pet shops was the mealworm. Back then most people keeping insect feeding reptiles had common Anoles shipped from the Southern United States or lizards they caught in the backyard. These were looked at more as curiosities that you knew would live for but a little while and then get replaced with something else. More or less these animals were treated like toys are now by kids that get cheap plastic distractions that last for a few days at most! Mealworms were the food always recommended to feed these hapless creatures and it was years before anyone had the thought to try crickets as a second choice feeder item. Crickets were starting to be marketed at that time as fish bait and were far too expensive to feed a $1.50 lizard! Mealworms have survived in the market place through some pretty rough times, especially as of late. All sorts of lies and misinformation have been thrown at them. Old wives tales of Mealworms eating through the sides of animals that have consumed them still persist today. Mealworms have born the brunt of a lot of bad press and, unfortunately, have been largely replaced as reptile feeder insects with the cricket and more timely Zophoba Worms. Although these other insects are certainly good feeder insects in their own right, so are Mealworms, in my humble opinion! There are advantages in feeding a wide assortment of insects of all types to predatory animals and the pitfall comes only when keepers get lazy and utilize one or two items only. Mealworms can be every bit as useful a feeder insect as the Zophoba or any other insect choice when wisely gutloaded and dusted. Don't believe for a second the bad hype against them. I know of many birds and reptiles that were raised mainly on Mealworms in the early days by pioneering keepers and they turned out just fine. Even back in the dark ages a few brilliant people had figured out that bugs of any kind were good as long as they ate good food before feeding them to a animal. Over the years I think I have tried my hand at rearing just about every insect that's popularly kept in captivity today. Absolutely no purposely reared insect compares to the lowly mealworm as far as ease of rearing, in my opinion. It just doesn't get any easier and they are the perfect bug to start with if you have never tried rearing insects before. Mealworms don't require a lot of space and can be reared in all stages in just one container if need be. I have developed my own way to keep and breed them but there are many variations to this that work and all have their own merits, I am sure. The absolute ideal place to rear all the bugs you ever will need whether it be Crickets, Zophobas, Mealworms, Buffaloworms or almost all others, is the so-called "rearing closet". This is basically an enclosed cabinet that is heated by various means to maintain ideal temperatures within for fast reproduction cycles of the above insects. Size can be anything from a small closet or cabinet to an expanded room or other contained area with controlled atmospheric conditions. I have seen really well insulated old refrigerators that no longer worked put to good use for this purpose and they have the added benefit of being easy to clean as a bonus. The bottom line here is you need a stable temperature area to really do a good job with rearing any insect. The mealworm is more forgiving in this aspect especially during summertime when temps are to its reproductive liking and breeding and maintenance is at its easiest. 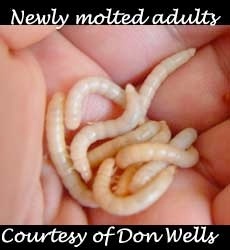 Mealworms will reproduce and produce multiple generations when temps are between 65- 90 degrees. The ideal rearing temps are between 75-85 degrees for year around production with quick life cycling. The cooler side will slow down growth and egg laying and higher temps will speed these up. Mealworms will tolerate lower and higher temps than will Zophobas that have lower tolerance levels for both extremes. Containing mealworms is simple. I use either cheap plastic tubs from any supermarket or any other non-chewable container that will hold the worms and beetles in and are easy to clean. Size is only important so far as how many worms you want to keep in any one container. Usually I will put around a kilo of worms in a standard washbasin type tub used in households for washing dishes or small batches of clothes. Keeping a good bed of feed material in with the worms will prevent overheating by friction from their own movement and will provide a good base for them to live in. 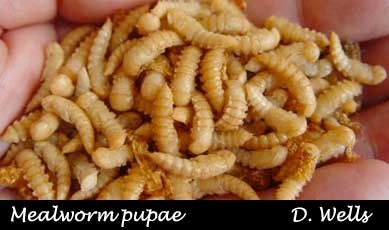 Mealworms do not crawl out of these and the beetles do not fly so an open topped container is fine for rearing them. Generally, I feed my mealworm cultures on Gamebird/Turkey breeder crumbles. This is a food that's well formulated for nutritional makeup and has additional calcium added for the hens that will lay large clutches of eggs. There are well formulated insect rearing feeds made for the express purpose of rearing feeder insects and these come highly recommended. 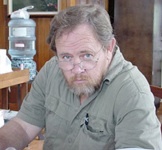 I have tried the food manufactured by Ziegler Brothers and also by Walkabout Farms and both are excellent. Mealworms will live quite well and will reproduce on any of these foods. Most commercial producers raise them on extremely impoverished diets of mainly Red Wheat Bran and the worms have been maintained on this for hundreds if not thousands of generations! The adage of "we are what we eat" should always be forefront in our minds and feeding even mealworms the very best feeds available pays off with more robust, active worms that carry important nutrients to the animals that will eat them. In addition to the feed above, I also add some vegetable to the top of the mix. My favorites are Whole Carrots, Bell Peppers, Thornless Cactus pads, Squash and any other red, bright green or yellow vegetable. Fruit is generally avoided due to higher moisture content that causes mold growth and other problems to enter a healthy colony. Mealworms will eagerly consume even green leafy vegetables so don't be afraid to experiment with this. Just remember to feed as much as they will consume quickly and don't heap wet produce in the culture that's not going to be consumed in a day's time. Wet soggy bedding is just pleading for trouble! Once you have a colony of healthy worms installed either from purchasing them or bumming them off another friend all you have to do is keep these bugs comfortable temperature-wise, feed them well, and stand back. Sooner or later you will start seeing pupae develop. Once the mealworms reach a certain size they can't help themselves and they will start pupating rapidly. Unlike the predatory Zophobas, Mealworms will pupate, become beetles and lay their eggs all in one container. I prefer to not allow this to happen, but more about this in a minute. If you start off with worms of an equal size you most likely will get pupation in groups and pretty rapidly after setting up the colony, if all things are right. Once I start seeing the pupae forming I prepare a second plastic pan and remove the pupae as they develop. Preparation is simply placing an inch or so of the Mealworm's feed in the bowl and that's it. The Pupae do not feed while in this stage so this serves no other purpose than to just give them bedding and little else. In a few days time the pupae will rapidly turn into beetles. Soon you will see light tan beetles emerge from the pupae and once this happens I add Carrots or other vegetables to feed the ravenous beetles who are more thirsty than anything else. The tan colored beetles will soon turn black and within a few days will begin breeding and laying eggs. You can keep adding the pupae to this colony since the beetles will not eat the pupae and they don't compete at all for any of the same resources. If you find your losing Beetles shortly after emerging the moisture content of your food is most likely the cause so make sure you keep fresh produce in for them to get much needed moisture and food value from. Mealworm beetles are quick to breed and lay eggs. Their lifespan, after becoming a beetle, is very short. A lot depends on the feed they get to sustain them. A good beetle lifespan is probably three weeks from the time of metamorphosis to death. By adding pupae continuously to the culture you keep the egg laying going over a long period of time. 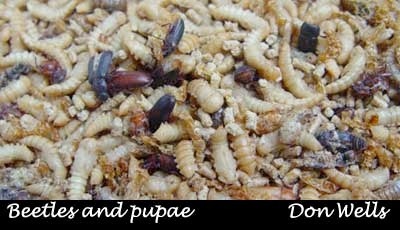 You can opt to add new pupae to other cultures also if you want different sizes of worms naturally sorted. Each batch will keep to their own sizes by doing this. 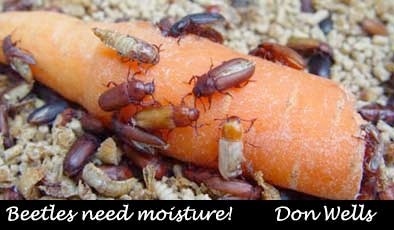 Many people do not realize how great a feeder insect a mealworm beetle can be! I much prefer them to Zophoba beetles which I have found very, very few animals will touch. On the contrary, mealworm beetles are relished by most reptiles. In fact, I know of some animals that will not eat anything else if given a choice between the beetles and crickets and other bug species. Don't overdue this of course but the beetles seem to give good roughage to a reptile's diet so feed them too. I have raised certain beetle-feeding Geckos on nothing else but these beetles and when others couldn't keep these species alive, mine thrived! After about two weeks of adding pupae to a plastic pan I will call this culture quits as far as further additions and will transfer more pupae to another pan or will remove the beetles that are in the old culture still and add additional feed. After four weeks usually a careful inspection of the base material will reveal millions of small hatched worms busily doing what mealworms do best and that is eat! From this stage to adulthood you can figure a time period of roughly six weeks depending on the temps, availability of good feed, and moisture giving vegetables. During this time you can select out different sized worms from each colony to feed your animals with. Remember to use a good gutload feed prior to feeding them and dusting with a good grade mineral powder is advised since Mealworms lean towards more Phosphorous than Calcium values and need supplementation to be really effective food for a herp. Some keepers will only feed mealworms that have a freshly moulted skin which leaves them for a short time very soft and white looking. I believe that, while this sounds reasonable, it's not necessary. When reptiles are maintained at their optimal temperatures they can easily digest the outer skin of even a brown skinned mealworm just fine. Only when animals have been highly stressed by some traumatic event in their lives do they seem to have problems with digestion much like many humans do also.